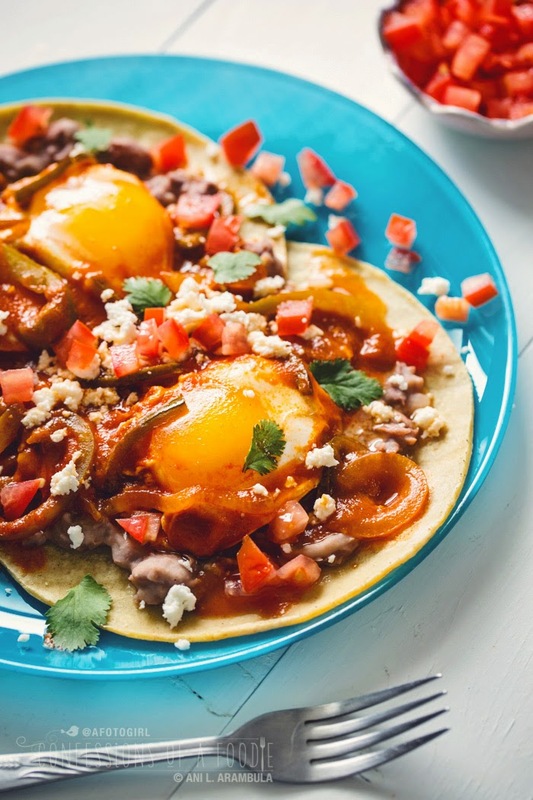 The best and only huevos rancheros recipe you'll ever need for this popular Mexican breakfast dish. People are often surprised when they hear my answer to what my favorite food is and I am always surprised that it catches them so off-guard. My answer? Eggs. I love them in virtually all their preparations and indeed I have ever since I was a child. In the mustardy goodness of my mother's deviled eggs, to her chunky creamy version of egg salad, and to soft scrambled eggs wrapped in a warm homemade tortilla, I am completely satiated. 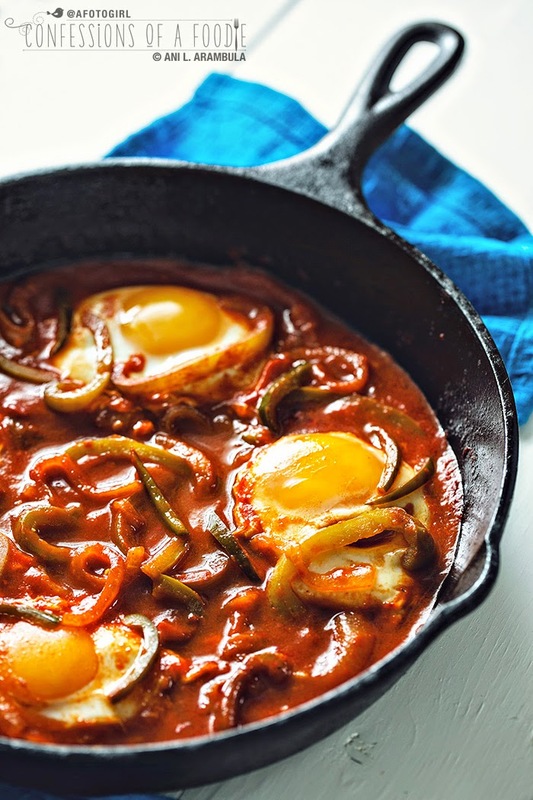 From simple eggs over easy as a child to their cousin, Spanish Huevos Fritos (Spanish style fried eggs) that I learned from my Texas gal pal, Julie when I was in my mid-20's, eggs have been my go-to breakfast, lunch and even dinner when times were lean and I needed a nutrient dense meal. Eggs often get a bad wrap for being high in cholesterol contributing to heart disease but much research today suggests that eggs in fact help elevate GOOD cholesterol while having little to no effect in most adults where bad cholesterol is concerned. This nutrient rich food, along with milk, provides the highest biological value of protein according to WebMD. Just one egg has only 75 calories, 7 grams of high-quality protein, 5 grams of fat, and 1.6 grams of saturated fat, along with iron, vitamins, minerals, and carotenoids. I, like most city girls, grew up on commercially produced eggs. We didn't know of any other kind. In my 20s after I was back from college, I would often spend my Saturdays on back country drives through the mountains of Cuyamaca and Julian and wind my way through the sleepy town of Ramona taking pictures of landscape I found interesting and beautiful. It was at the very edges of Ramona, on my way back to "civilization" that I discovered an egg farm stand. It is to this day, a tiny drive through stand off the main highway on a dirt and gravel road the building so small in fact that if you didn't notice the signs leading up to it, you'd wind up driving past it without ever noticing as I had done on so many occasions prior. Finally noticing it, I stopped one day and picked up a flat of jumbo eggs, took them home and proceeded to make eggs for dinner that evening. It was like I had never tasted an egg before. I had originally intended to make scrambled eggs but when I cracked open that first shell and out poured the brightest, orange-y yellow yolk and the clearest liquid surrounding it that I had ever seen, I knew I had to make over easy eggs instead. As the eggs cooked, the yolk got even deeper, richer in color and literally, oozed out gently, thickly like golden syrup when I cut into the beautiful golden dome. Mr. Farm Fresh Egg, where had you been all my life? 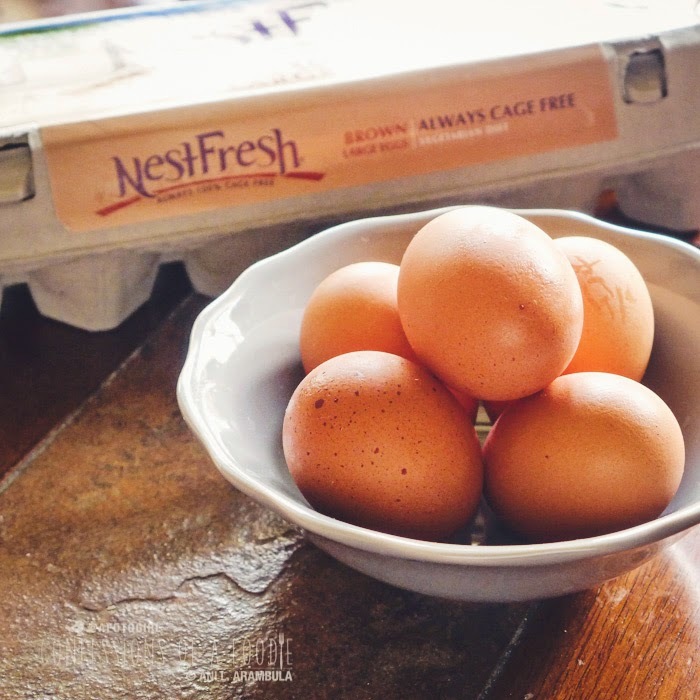 A few weeks ago, I saw a post from Jackie (theseasidebaker.com) on our San Diego Food Bloggers Facebook group page asking if anyone was interested in receiving eggs from NestFresh for review. Naturally, I responded immediately. If I could find farm fresh eggs at my neighborhood grocery store and save myself the 2 hour round trip for farm fresh eggs from Ramona, I'd be a very happy camper indeed. Less than a week later, coupons for four free dozen NestFresh Eggs arrived in the mail. I went online to find where I could buy them as my most frequently shopped store, Fresh & Easy, didn't carry them. 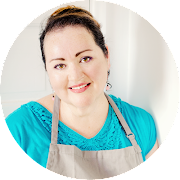 Their website says that in California, NestFresh is available through Amazon Fresh (limited delivery areas and my 'hood isn't one of them), Albertsons, Superior, Walmart, Bristol Farms and as NatureFed at Whole Foods. My coupons specifically said NestFresh so I knew Whole Foods was out. Bristol Farms is 30 minutes away. I went to three Walmarts and didn't find them there. Finally I stopped at my local Albertsons and bingo! Rich in color, texture and taste, these NestFresh Cage Free Eggs were every bit as delicious as I'd hoped they were. They made excellent poached eggs, beautiful sunny side up eggs and creamy bright soft scrambled eggs. Egg heaven here. Next up is using them in baked goods and pasta carbonara. "NestFresh strives to provide you and your family with a more sustainable, humane alternative to conventional eggs, which are produced in caged facilities. We insist on producing cage free and organic eggs to create awareness about the need for humane treatment of egg laying hens and the importance of environmental responsibility." The NestFresh mission statement above caught my attention. Started in 1991 in Colorado by a family that wanted a company that was environmentally conscious and focused on animal welfare and sustainability. It quickly became a Colorado favorite so they decided they wanted to take it across the country. But how to do that while avoiding shipping and increasing their environmental footprint? The answer was in locally sourcing eggs. Live in an appropriate and comfortable environment that includes sufficient space, proper facilities, shelter, a resting area, and company of their own kind. Disclaimer: NestFresh Cage Free Eggs provided me with coupons for this review. As always, all opinions are my own and I was not otherwise compensated. I remember the first time I ordered huevos rancheros at a restaurant. I was so disappointed. The ranchero sauce was bland and was more of a chunky salsa (which is NOT ranchero sauce) and didn't even have bell peppers. Plus the eggs were fried and the ranchero sauce was just sparingly ladled over the top. Boring. I grew up on mom's huevos rancheros. And I thought they were the only way to make them. Her eggs where always so flavorful and her ranchero sauce was rich whether it was used for eggs or her chiles rellenos. What did mom do that was so different but to me seemed perfectly normal? She poached her eggs IN THE SAUCE. Yes, you read that correctly and this makes all the difference in the world. 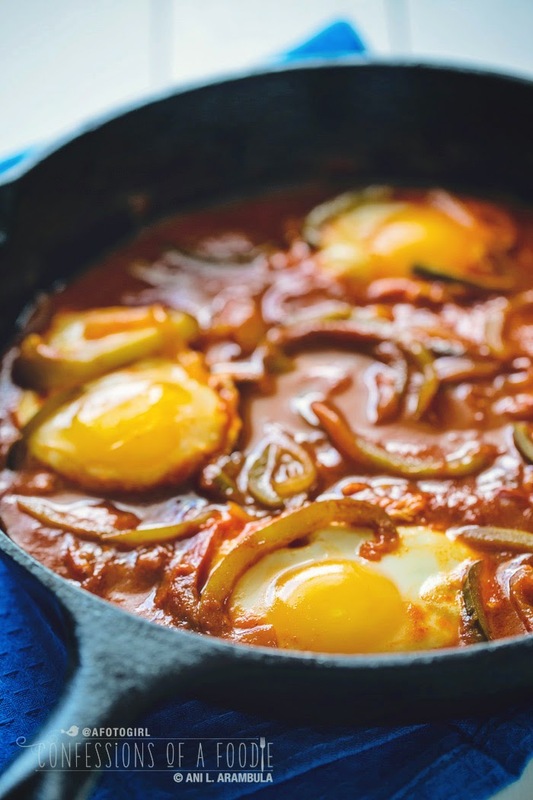 Besides being healthier since you aren't adding more oil to the dish, it makes the yolks rich and creamy while the whites absorb some of the yummy flavors of the ranchero sauce. This is my interpretation of my mother's Huevos Rancheros recipe. It's basically her recipe with the addition of the poblano which I like as they provide just the slightest heat. If you want even more heat, add thinly sliced jalapeños instead of the poblano. 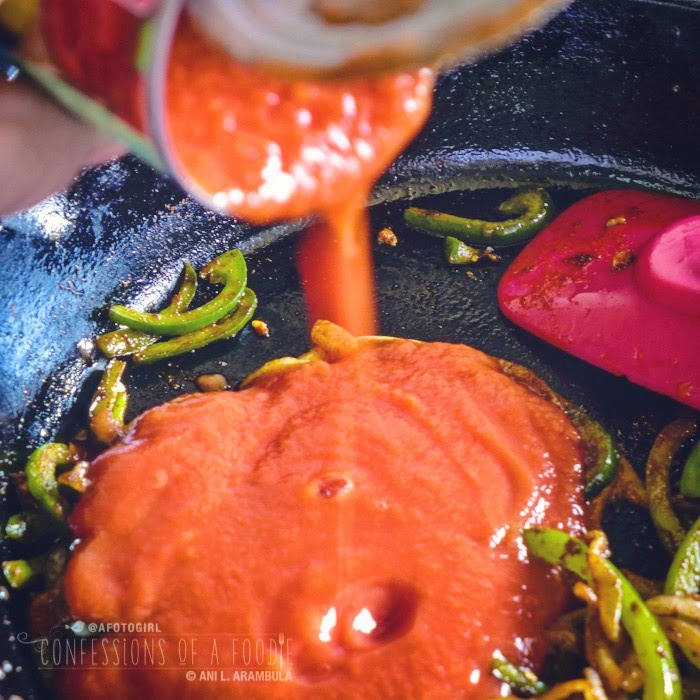 If you caught my Chiles Rellenos post, then you already know how to make ranchero sauce. The sauce is super versatile and once mastered, can be modified for your tastes and used in so many other ways. Try ranchero sauce over skirt steaks or mix in shredded chicken for tacos. Dad will add cilantro to it and uses it to braise short ribs in. Delicious. Try this recipe and let me know how you like it. 1. 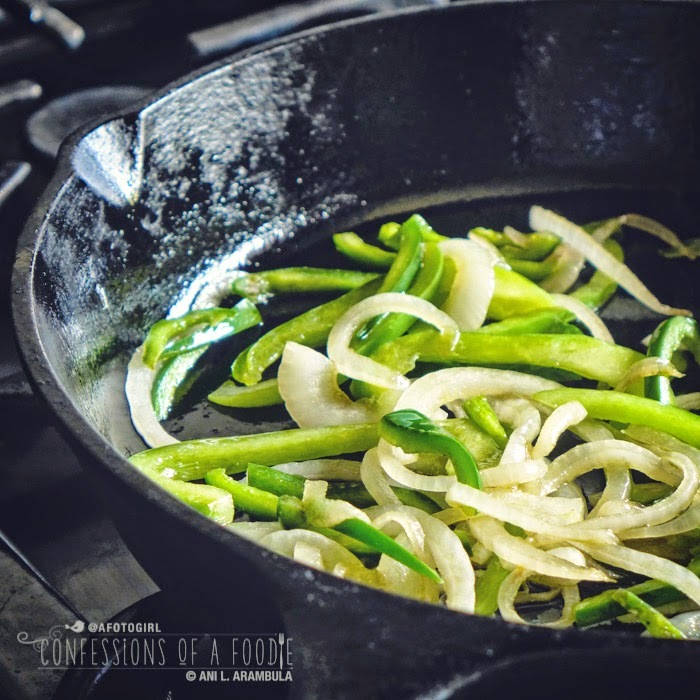 Heat olive oil in a well seasoned cast iron skillet or a non-stick skillet until shimmering. Stir in onions and cook for 1 minute. 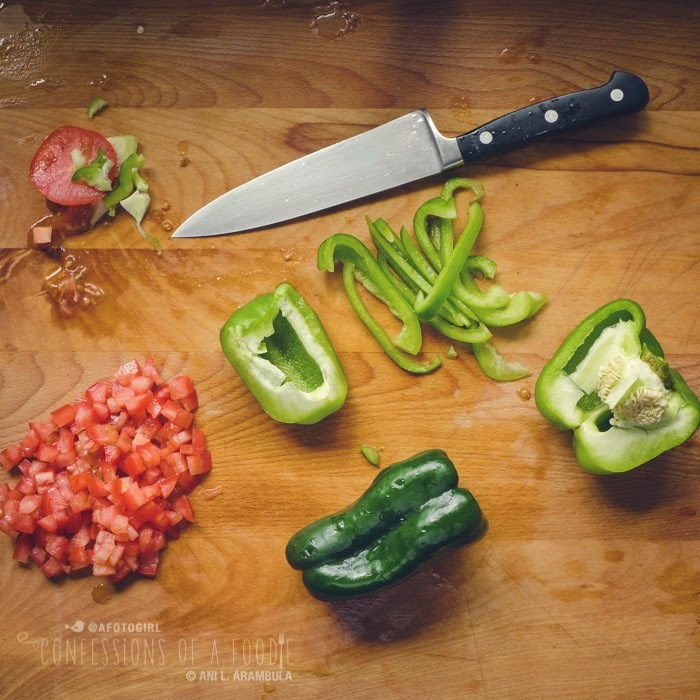 Add bell pepper and poblanos and sauté until vegetables are tender. Stir in garlic and cook for 1 minute longer, stirring to keep garlic from burning. 3. 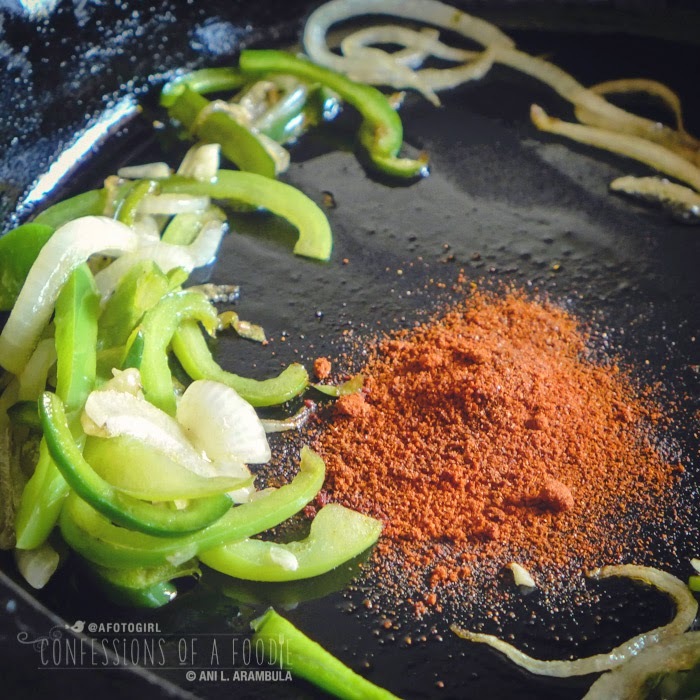 Stir in the chile powder and cook for no more than 30 to 45 seconds, stirring constantly so as to not burn the chile powder. 4. Pour in the tomato sauce and bouillon; stir well to combine. Add water to the tomato sauce can, swirl to clean off the sides of the can then add to the pan. Bring sauce to a quick boil then turn heat to low to maintain a simmer. 5. 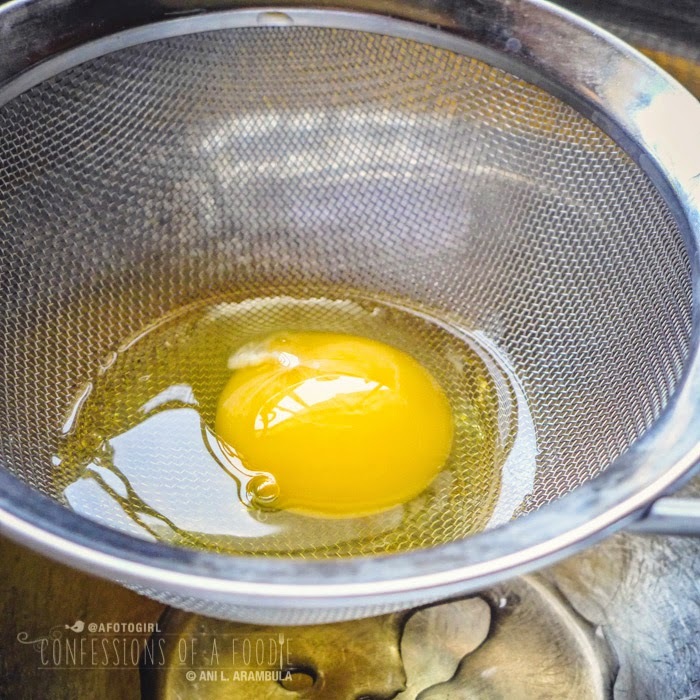 For perfectly poached eggs, place a small sieve over a bowl and crack the cold egg into the sieve. The runny white portion of the egg will filter through the sieve leaving behind the thick white liquid and the yolk. 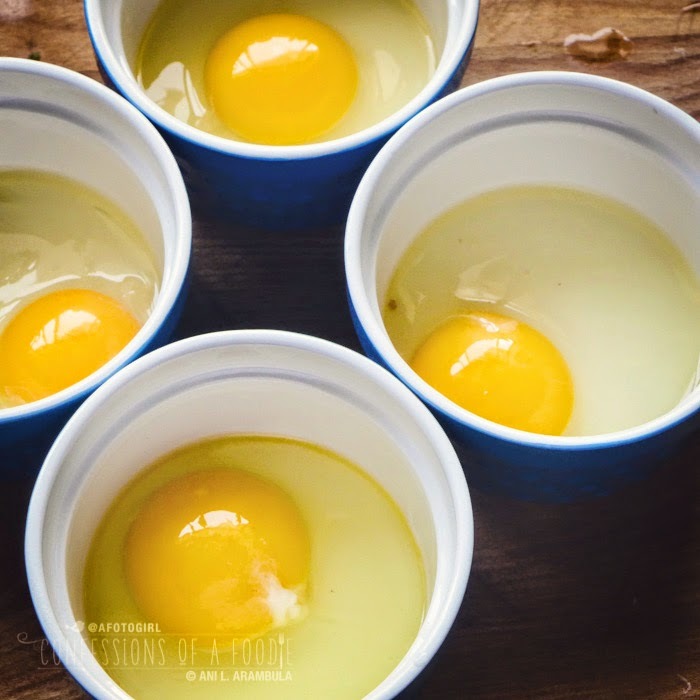 Remove the egg to a mug or small bowl. Repeat with remaining eggs, each going into their own small mug or container. 6. Check on sauce. If too much water has evaporated or if it has thickened too much, add more water to thin out. It should be more soupy than gravy-like. 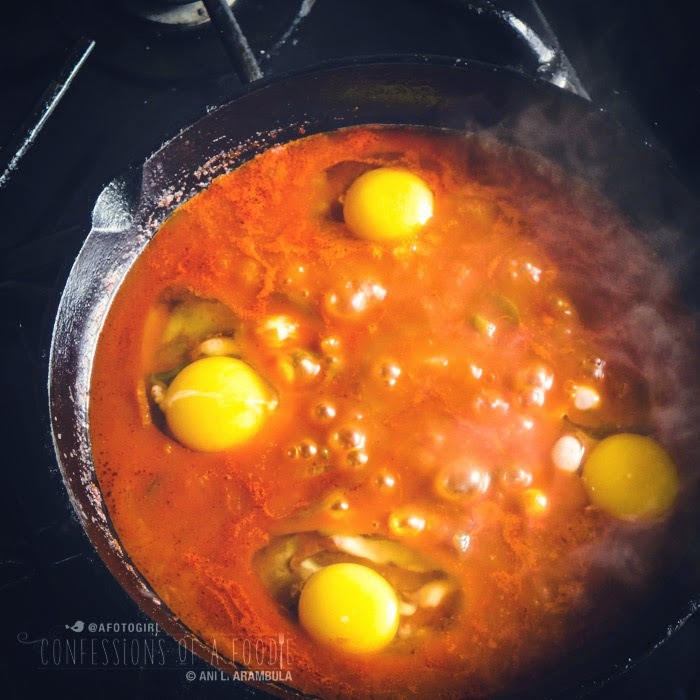 Bring the fire up to maintain a good simmer to just barely bubbling (adding the eggs to boiling sauce -- or water for that matter -- will toughen the whites) and carefully place eggs in equal distance from each other along the outer edge of the pan. Turn heat to low and let the eggs hang out in the sauce, undisturbed, for one full minute. This allows for the white portion of the egg to settle away from the top of the yolks which will keep the yolks from developing the thin white film over it. 7. After a minute to a minute and a half, use a tablespoon to gently pour some ranchero sauce over the whites of the eggs until they set but are still jiggly. Just before they are entirely set, gently spoon the hot sauce over the yolks to set their tops. Total cooking time should stay in the three minute range for soft set whites and runny yolk to five minutes for firm whites and thick to set yolks. 8. Warm tortillas and divide among two plates. 9. Divide the beans between the four tortillas and spread to cover. 10. Carefully place an egg in the center of each tortilla and divide the sauce among the four tortillas, carefully ladling so as to not break the yolks. 11. 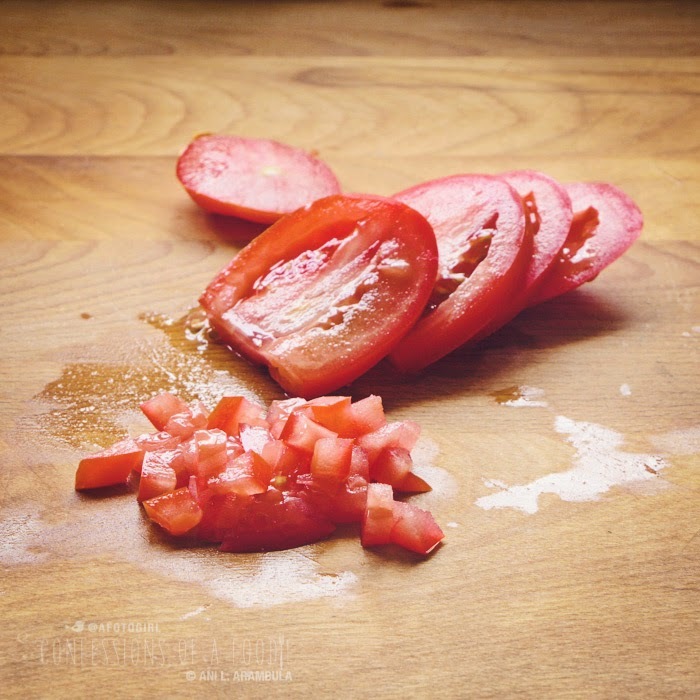 Garnish with the cheese, cilantro and fresh tomatoes. Note: I prefer Hunts brand because it's made from 100% tomato puree and has no added sugar. NestFresh is providing coupons for 4 dozen free eggs -- enough for a month of free eggs! Plus a prize pack that includes a water bottle, tumbler, recipe cards, spatula, pastry brush, jar opener and possibly some other kitchen accessories. Pretty cool, eh? I'm excited for my one lucky reader who gets to try out these yummy eggs. Follow the instructions in the Rafflecopter widget below. You must use the Rafflecopter widget to be eligible to win. You can earn up to 5 entries today and receive an additional entry once per day if you tweet about the giveaway. You have one week to enter. Contest ends at 12:00 on June 4. Winner will be announced here and on my other social media platforms. Winner will have 48 hours to respond via email to claim their prize. If no response is made, a new winner will be announced. Giveaway prizes to be fulfilled by NestFresh Eggs.Open to U.S. Residents only. I'm a big egg eater myself, usually scrambled or in omelets. It made a big impression on me when, after his heart attack, my husband was served a whole boiled egg, yolk and all, in the hospital cardiac unit. Whoa, that I find very interesting. I think it's like most things... Everything in moderation, yes? Good luck with the the contest Liz! I love a good omelet with mushrooms, spinach & cheese! Poached eggs are one of my favorites as well! A winning combo for sure, Elizabeth! Good luck with the contest! Yum! And summer is a great time to make them, too! Good luck with the contest! My go-to order item when I'm out for breakfast! Good luck with the contest, Ann! Eggs Benedict. But maybe the runny yolk is what I like best! Yay, for runny yolks!!! Good luck with the contest, Lynn! Ani, this looks delicious! I've never made huevos rancheros at home and always loved the appeal of its name - reminds me of the cowboy life on a ranch. I love eggs just about any way- but I am fond of an egg over easy with toast- it is just pure comfort food for me. First time I had a quiche, I was in heaven! ;) Good luck with the contest! I love to eat my eggs scrambled! I like to make egg muffins with spinach and sausage. I like scrambled eggs. I also like to make chile rellenos using eggs.